Use Bear Paws to handle the heavy roast or grab that slippery ham. 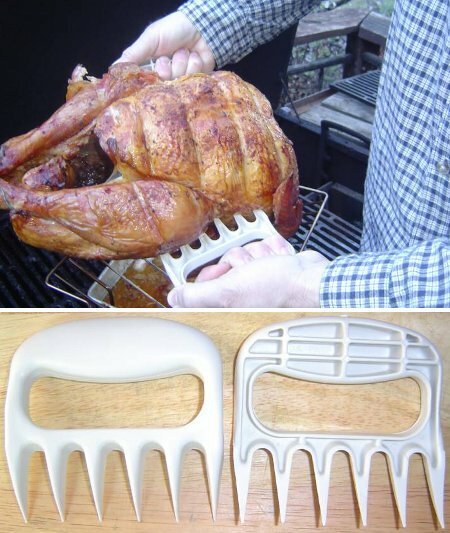 These plastic claws allow you to lift, move, and carve turkeys, hams, roasts and other large food without touching them, and since you’re grabbing the heavy food items closer than with a fork, you have more control. The “super sharp” Bear Paws can be used to shred meats or to keep your fingers out of harm’s way while you’re carving the turkey. The slip-free plastic handles won’t transfer heat, so you won’t be paying hot potato, or roast for that matter. The paws won’t scratch coated surfaces, and when you’re done you can throw them in the dishwasher. Made in the USA, Bear Paws come in ivory (the color) and brown. You can pick up a pair for about $10. My mother-in law has a set of these, and I tried them once before I knew I HAD to have a set. 100 times easier and stronger than the “giant fork” style turkey and roast lifters. Is this another cook like a Klingon thing? I’d like to sand cast these babies in metal! Strangely I was hungry when I found the Bear Claws and the Fork It Over. My stomach overruled my brain and made me post them. The Bear Claws look like they’d make wicked “brass” knuckles though. I like my Bear Paws. I read about them on my cooking site and thought they sounded like they were worth a look. They are also great for shredding roasted pork for carnitas. Many more tines and easier to handle than a fork. My kids were all excited when I bought them and they kept disappearing for the first week or so. I had to make sure to wash them before I used them until they got over it. What Ben says. These things look like they’ll drain moisture from your turkey faster than a jetski on full throttle. 1. Absolutely require a gorilla-strong grip and wrists. Can’t see my ol’ Ma using them. 2. Maybe you *can* toss ’em in the dishwasher but in my experience plastic things with lots of exposed mold cavities don’t come clean, or bash about. 3. Another specialty niche device to plug up the already overloaded drawer, unlike a set of silicone mitts. 4. Should be transferring hot turkeys and roasts in a pan where they wont drip hot oil on your legs or on the floor. 5. I don’t actually like shredded turkey or beef. I got a pair of Pampered Chef Meat Lifters as a Christmas gift. Overbuilt with perpendicular handles (compared to the Paws), they don’t require as much wrist strength and keeps hands further away from the hot meat and juices.